Life of a Catholic Librarian: Teeth & confession updates (oh joy) and Divine Mercy novena! 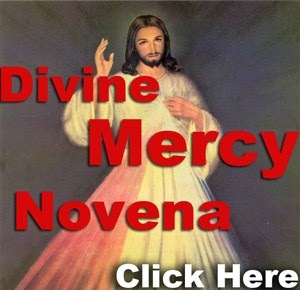 Teeth & confession updates (oh joy) and Divine Mercy novena! Hello! Happy Holy Thursday. :) I have to work the evening reference shift tonight, which I'm bummed about because it means that I can't attend Mass, but I'm persevering. It's going to be a LONG day to be sure. Well, first, in secular news, I had one of two periodontal followups to check on my post-operative state. It went well. The tissue graft is looking awesome apparently, although I have to wait another 2 weeks to have any stitches that don't dissolve on their own clipped off. The roof of my mouth, however, is "looking sore," which I of course already knew, since it had been hurting like a *%$! :0 This roof wound was definitely tougher this time around. It is, though, healing, and yesterday for the first time I didn't wake up with it already bothering me and needing to take some ibuprofen. Today as well. I can feel definite improvement. They prescribed this special mouth rinse that will help the wound to heal faster. My honey is picking that up for me today, God bless him. I go back in 2 weeks, but I'm on the mend. The exterior bruising is also nearly completely faded. "There's a confessional open over there. It's *just the screen* though." She said that like it was a bad thing. :0 I much prefer using the screen rather than face-to-face, which is what they were all waiting for. I thanked her and hurried over, in and out of my screened confessional in a few minutes. I prayed for a spell and then got up to go. Those other ladies still hadn't moved. :0 That's the line I was in yesterday that didn't move. Must be a very detailed priest. Pleased, I hustled out to my car so that I could drop off my prescription before going home for dinner, and I made it in plenty of time. Whew! Before I go, I wanted to mention the next novena from Pray More Novenas. I am *super* excited. I prayed this novena last year, and loved it. And this year it is leading up to the canonizations of John Paul II and John XXIII! What a beautiful day that will be. As you know, John Paul II is a personal and much beloved favorite of mine. So I will begin praying along tomorrow. If you sign up with Pray More Novenas, you will receive an email each morning with the prayers, and it is extremely convenient. I also like knowing that I'm praying along with others worldwide. So, join in! All right everyone, back to work for me. I won't be blogging Good Friday or Easter Monday, but I will return to you Tuesday of the First Week of Easter bright eyed and ready to relay my Easter adventures. Until then!